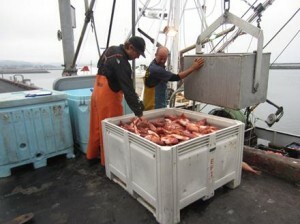 The National Oceanic and Atmospheric Administration (NOAA) today released a report on the results from the first year of catch shares in the West Coast Groundfish Trawl Fishery. With the positive and transformational changes the fishery has seen, EDF is proud to have worked closely with fishermen and fishery managers to see the IFQ program developed and put into place. The 2011 report’s findings were remarkable, citing dramatic reductions in bycatch and discards after catch shares implementation. Before catch shares, the non-whiting fleet had a discard rate which ranged between 20-25% and in 2011 after implementation discards plunged to 4.8%. Groundfish trawl fishermen deserve positive recognition for their efforts to make the new system work. Still, a suite of costs associated with the program – along with the fleet’s debt from a 2003 vessel and permit buyback – warrant swift action. Specifically, fishermen are required to pay an increasing share of the cost of onboard observers, ultimately paying 100% of those costs by 2015. They are also required to pay up to 3 percent of ex-vessel revenues as required under the Magnuson-Stevens Act to pay for the catch share program’s administration and operation. At the same time, the overhanging buyback debt absorbs 5% of their ex-vessel revenue. Together, these costs amount to between 10 and 20% of a fisherman’s gross income – a burden that could undermine all of the investment and benefits from this new program. EDF has been working with fishermen, with Council staff and with leaders at NOAA Fisheries to find solutions that will reduce costs for the trawl fleet while maintaining critical program components like 100% accountability. Finding those solutions will be essential to achieving the long-sought stability and profitability of the fleet, and for helping fishermen and processors continue to provide healthy, delicious, sustainable seafood. This entry was posted in Pacific. Bookmark the permalink. Both comments and trackbacks are currently closed.